Nine days of vacation in the Northwest down, one to go. We get to hike in places most people only know about from eighth grade geography (Mount Rainier, the Olympic Peninsula, and the Oregon Coast). When hiking at Beacon Rock yesterday, a couple told us that the Eagle Creek Trail across the river in Oregon is the hike of the Columbia River Gorge. That’s all the encouragement we needed to give it a go. Awaking in The Dalles, a town some 90 miles to the east of Portland, Oregon, we drive east on I-84 along the Columbia River Gorge heading for the Eagle Creek Trail where we are promised falls and more falls. On a Tuesday morning in early June, we believe we will not be inundated by the hiking public as we would be on weekends or all summer long. 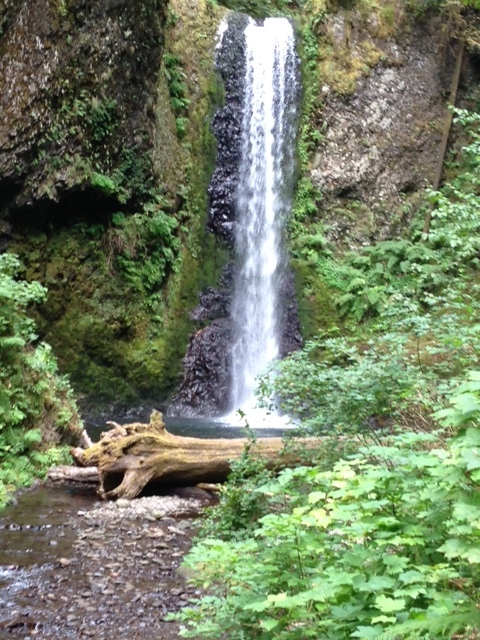 The Eagle Creek Trail lies 20 to 200 feet above, as you might imagine, Eagle Creek. With soft packed dirt covered with pine needles on this easy-to-follow trail, we set our sights on Metlako Falls. Covered by the forest canopy, we find the mid-70s temps most comfortable in our tee shirts and lightweight shorts. Sun sparkles on the falls some 200 feet away; as such, the dark of the forest contrasts with the sun to make it nearly impossible to get a picture of these first falls, or if truth be told, be impressed by them. At this point, the trail turns rocky, similar to the Appalachian Trail in Pennsylvania. 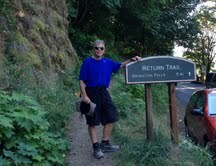 Two miles into our hike, we see the sign for the Punchbowl Falls side trail, which we use to descend to the river bottom. There we find a party atmosphere of kids splashing in the mountain pool at the base of the falls. Twenty some people lounge about on what we learn is the typical end destination for day trippers seeking to beat the heat. Even on this Tuesday in early June, we see many hikers in groups as we are now only 40 miles from Portland, with a million people in its metro area. While many appear to be college kids on summer break, we do see a group of high schoolers here for some nature study. These falls are not drop dead gorgeous or National Geographic memorable as the ones we have seen over the past week at Mount Rainier and Olympic National Parks, but they’re fine. To escape the heat, college women in threes and fours are here; some amazingly in flip flops on this very rocky trail. These 80s and 90s are unusual for Oregon in June which typically gets its Arizona heat in August. Drought has come to the Northwest, though you can’t tell if from Eagle Creek Canyon with its lush vegetation, ferns without end amen, and shaded forest. We return to the main trail with our destination of the High Bridge a mile and a half away. 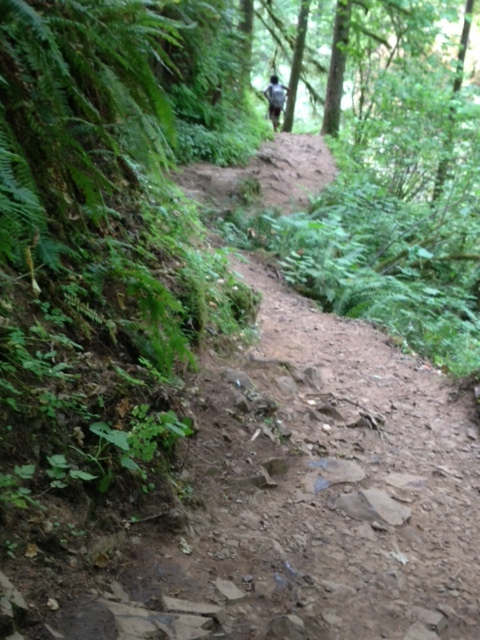 As the rocky trail returns, we see far fewer hikers venturing past the Punchbowl Falls. There are overnight backpackers who have come from Tunnel Falls and beyond with their heavy packs on a warm day, which just makes me shudder. I am soft. Throughout the trail there are braided strands of one inch thick wire anchored into the mountainside; they indicate where the steep drop offs are. The vegetation is so lush that we are not always aware that we are hiking within feet of 70 to 100 foot drop-offs. It’s never scary, but we remain aware. I wouldn’t take our grandsons Owen and Max here until they are older, but then I’ll be all over getting them 0ut on this trail. We pass another waterfall just before High Bridge. Clandestinely, young people have climbed down into the river canyon for some sunning and cooling off under the waterfalls. There is no obvious trail down; the one place that might be a trail is steep and treacherous and says “no way” to those of us north of 65. At High Bridge, a volunteer work crew has carried twelve foot planks three plus miles to recondition the bridge across the canyon fifty feet below. We thank them for their service as if they are military. In a way, they are – another group serving the American people. Due to the side trails we took to the earlier falls, it’s nearly two hours of hiking to the High Bridge. As we head back for the trailhead, we now are passing gaggles of early afternoon hikers at most every turn. It’s not overwhelming, and one even takes our picture. One can only imagine what summer weekends are like. Rental Car Tip – Know the hours of operation if you rent from off-site budget-priced car rental companies. We got a burning deal at Payless Rental Car: $231 for ten days! The Volkswagen Beetle was a dream. What we didn’t realize is that Payless’s away from the airport rental center is only open from 7A to 11P. Since we need to be at the Portland Airport at 530A Wednesday morning for our nonstop flight to Boston, we are unable to drop the car off early enough to get the Payless shuttle van to the airport for our flight. We scramble for a plan B that has us dropping the Volkswagen Beetle off the afternoon before at Payless and finding a Quality Inn (we were going to need a motel room anyway) with shuttle service to the airport any time of day or night. It turns out not to be a big deal, but it could have been messy if we had assumed Payless Rental Car is open at all hours. And then we have a things happen for the good moment. After dropping off our car at Payless on a warm Tuesday afternoon, we figure the Payless shuttle driver will take us back to the airport; then we’ll call the Quality Inn to pick us up there, spending up to an hour in this transfer process. But the sun is shining on Dan and Hannah as the shuttle driver takes us directly to the Quality Inn. We over tip him and toast his good health with a last-night-of-vacation glass of wine. 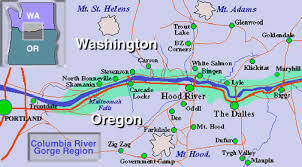 With our ten days of hiking in Washington and Oregon drawing to a close, we land at Vancouver, WA, just across the Columbia River from Portland on a hot Sunday afternoon in early June. Here at the prelude to the dry season in the Northwest, we get a dash of Arizona heat as the temps are in the upper 80s and going to 100F in the interior. Walking less than a mile for Subway subs, we find the main drag quiet with just a few restaurants having outside patrons; but really very little is going on. Our attention is caught by a jovial young man with a marijuana leaf on this tee-shirt outside of Main Street Marijuana, I ask if I can take a picture of the window sign; I am reminded purchasing Mary Jane is legal in Washington, but I wonder how discrete folks are when buying their weed. He says, You can take pictures inside if you want. Never having been in such a store selling pot, we see a bustling crowd of folks in what looks like a jewelry store. No one pays attention to my iPhone picture taking; perhaps the smell of weed has something to do with that. We pass on the $10 special marijuana oatmeal cookie and the $10 for o.75 of a gram of Indonesian Haze. All deals, or excuse me, transactions are cash only. Forgoing on all of the 50 cannabis strains under $25, we slip out pleased that the country mice from Maine are a little more ganja hip. Inland near The Dalles, OR the temps are going to 100F. Phoenix in the Northwest is not what we expected. After rain and hiking in the 40s and low 50s last week in Mount Rainier, today is an adjustment. After living ten years in the Valley of the Sun (Phoenix metro area), Hannah and I moved to Maine 33 years ago to escape the neverending late spring/summer/early fall heat. The relentless 100s and 110s from May through September just got to us. And the highs for the day weren’t the worst of it. It was the morning lows in the 90s that made for one long hot day, day after day. And don’t get me started with it’s a dry heat. It’s like an oven; full body sweating begins as soon as you’ve taken twenty steps. Tooling down route 14 on the Washington side of the Columbia River Gorge, 50 miles later we enter the roadside parking lot for the Beacon Rock State Park on the right. Across the highway is the trailhead for the Hamilton Mountain Trail, which we hiked just one week ago. (See my blog. Go to the left side, click on the “Oregon” category to find that entry). Beacon Rock, so named by Lewis and Clark, is a monolith that gives off a vibe of Angel’s Landing in Zion National Park. The guidebook promises 870 feet of elevation gain over just a mile. Looking at the mountain core left from a volcano, it looks like there is no way, Jose up this mountain. That’s where Henry Biddle comes in. Back in 1915 Hank purchased the rock for a dollar; during the next three years he constructed a trail with 51 switchbacks, handrails and bridges. Immediately as we enter the lush forest on the banks of the Columbia River itself, we see a 1937 stone dedicated to Henry Biddle, the architect and trail designer. We have no idea how impressed we will soon be with his handiwork as we enter the forest on a gentle grade to the mountain. We spot a confounding sign. The loose rock trail is open; the paved trail is closed? Being the rebels that we are, and having at least a lick of common sense, we opt for the paved trail. Soon we are on the Columbia River facing side of the monolith. And then there are Henry’s beloved switchbacks. Up this sheer wall he has built switchbacks into and on the edge of the mountainside for, our and your, hiking pleasure. With wire fencing at the curves and two-bar metal handrails all the way up, they take all the steepness out of the climb. Having arriven (Microsoft Word claims that’s not a word! – must be an abridged version of their dictionary) a little after 9A on this preseason Monday, we pass a few others who are also out early on the trail. This signature hike on the state of Washington side of the Columbia River Gorge must be swarming with people throughout the summer, and especially on weekends. In no time the back and forth-ness of the switchbacks takes us high above the Columbia River Gorge. Though I wouldn’t take our preschool grandsons Owen and Max on this trail, school age children with their parents would enjoy this family hike. Near the top, the trail wraps inland, though still paved with metal handrails as protective fencing. 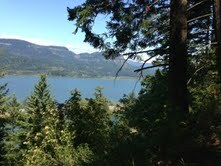 In a mere 25 minutes we are at the top with views east and west to the Gem of the Ocean, the Columbia River. It is amazing how easy this “steep” assent is. We bid our good-byes to a Texas couple with whom we exchanged picture-taking. In 20 minutes we are back at the trailhead. 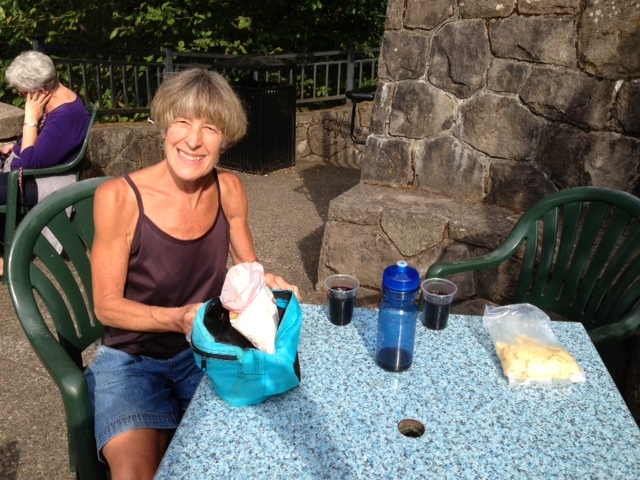 With only 45 minutes of hiking in the books, we opt for the Rock to River trail which is three quarters of a mile to the Columbia River waterfront from the same trailhead parking lot. Descending gradually, our trail has ferns and wide green leaf plants brushing against our legs as we head riverside. There, we climb down on a river dock with a front door view of the Beacon Rock monolith itself. After a couple hours of hiking, we want more on this our penultimate hiking day in the Northwest. For us that means driving five miles east on route 14 where we will channel our inner Cheryl Strayed, the author of Wild. We’ll figuratively hike with Reese Witherspoon, the star of the movie version of Wild, as we make our first steps on the Pacific Crest Trail. The PCT is a 2663 mile trail from Mexico to Canada through the Left Coast of California, Oregon, and Washington. While the PCT is some 400+ miles longer than the Appalachian Trail, today we will sample only a few miles of its challenging path north to Canada. We’ve come to the Northwest to hang out with our Arizona State (Harvard of the West) friends Patty and Kent and hike the trails of Washington and Oregon. Arriving by Alaska Air at 830 Saturday night on the Left Coast in Portland, it’s nearly 11P before we arrive at their place in McMinnville. It is 2A ET by our body clocks (wah-wah-wah), but when Patty’s homemade Sangria comes out, we are up for the next hour old-friending it. Sleeping six hours, we make our Sunday a lazy day of Patty’s loaded omelets and home fries, a 50 minute drive south to the capital of Oregon for the Unity of Salem service; followed later by naps and our traditional Mexican food out together. Overnight, we are awakened by thunder on this the first day of June. Packing up early at 5A to beat the morning commuter traffic in Portland, we head north on route 99W on our way to the Washington side of the Columbia River Gorge; with the rain light and intermittent, our fingers are crossed that it will be at most light rain for today’s hike. Driving east along the Columbia River, we set our sights on Camas, WA for breakfast. While we each have our two eggs, home fries, and a homemade biscuit at Smitty’s Family Dining, we see the rain kicking up from the passing vehicles. The day has got soggy written all over it. Thirty-one hundred miles from home in Maine and with just ten days to hike the Northwest, we know it’s going to take more than a little rain to keep us off the trail. The state of Washington tourism guide identifies the moderate-with-a-few-difficult-spots Hamilton Mountain hike as the premier trail in southwestern Washington. It’s a six mile round-trip with 2100 feet of elevation gain above the Columbia, the Gem of the Ocean. With only one other car at the trailhead parking lot at 9A this workday Monday, we pack for rain. At the moment no rain is falling from the threatening cloudy sky of grey and black; we stow our ponchos in Hannah’s backpack for the climb and load my fanny pack with water, apples, and our favorite Nature Valley granola bars. Under the forest canopy of old-gr0wth Douglas fir, we take to the sweetest of ascending trails. Here in the rainforest, the packed dirt path is covered with pine needles. For a mile it’s easy-peezy hiking with a steady climb. Used to being guided by white blazes when we hike the Appalachian Trail, we have no such markings here; that said, this well-maintained trail has signs and we never feel lost. 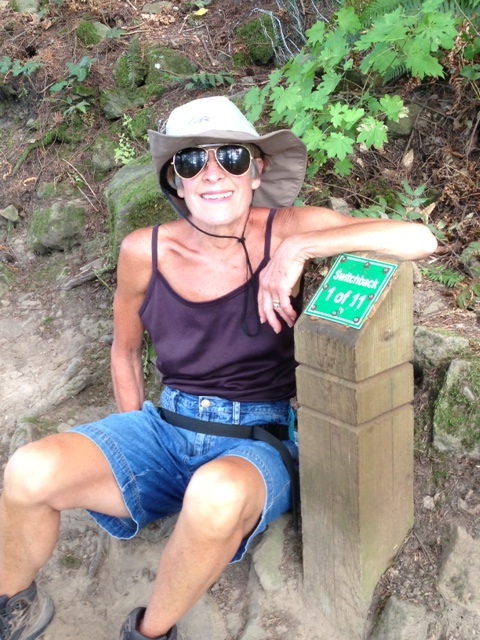 The trail guide says a healthy dog, a child, or a senior citizen can climb to the top. 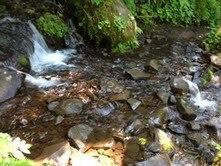 One mile into our three mile ascent, the Hardy Falls and the Rodney Falls are splashing treats that await us. Hidden by the trees on this south facing slope high above the Columbia River, the Hardy Falls teases rather blows us away. Soon we are directed to the Rodney Falls which cascades into the Pool of Winds beneath. On slippery waterfall-splashed rocks, we are protected by a wire fence as we feel the spray from the thundering glory of this spring-fed waterfall. Choosing the direct assent of Hamilton Mountain, we pass a sea of ferns and giant green leafy plants which bracket our trail. Vistas to the Columbia River allow us to see a mile or two up and down the river despite the heavy overcast. As the trail steepens, it turns rockier as we head into the interior and leave the wide river scenes behind. Though it has rained overnight, the trail is more dry than wet as we step carefully up the steeper parts. As we approach the mountain top, the trail returns to the easy going dirt and pine needles. The wind is picking up and the chill makes me wish I had a sweatshirt. An hour and a half into our hike, we still have no rain and know we must be close to the top. The below video shows some of the mountain trail which turns out to be within 100 yards of the summit. There we meet Tony and Mike and their black lab Bug who have just summited themselves. Agreeable guys in their thirties, we talk of past hikes at Mt. St. Helens; they encourage us to climb Beacon Rock (an Angel’s Landing-like promontory) directly across highway 14 from the Hamilton Mountain trailhead. Atop the mountain, the guide book promises panoramic views of the Cascades. If there are Cascades, we see none of them as we are smack dab in the middle of a cloud. Feeling spunky and cocky that no rain has fallen, we decide to hike Beacon Rock after we finish Hamilton Mountain. Scooting down the mountain, almost skipping on the trail that at this point is rock-free, we still hope to beat the rain. Thirty minutes into our descent, we try to ignore the first drops of rain, hoping that they are just atmospheric anomalies. This is under the theory that if we ignore the raindrops, they won’t increase. But soon we hear the pings of rain on the leaves of the oaks. Though we are mostly under cover from the forest canopy, we decide not to risk getting soaked and slip on our bright Washington-evergreen ponchos. With two unexpected hours of rain-free hiking, we count our blessings. The below video catches us at the Rodney Falls as the rain is picking up. The trail becomes slippery but nothing that we can’t handle by stepping carefully. The toll of the 2100 feet of elevation descent is making my knees bark. In a rash act of maturity (the first of two in the next twenty minutes), we choose not to hike the steep Beacon Rock today in the rain and save it for our return next week. At the trailhead, we fold our ponchos inward to keep the rain from soaking what else lies in our trunk, grab an apple and some strawberries, and check the map for the shortest way to Packwood, WA; where we have reservations at the Crest Trail Lodge, near the entrance to Mount Rainier National Park. Noticing roads on the map that are closed in the winter and appear serpentine with a capital S to the east of Mount St. Helens, we strike a blow for adult onset maturity and double back on highway 14, then north to drive 70 miles on I-5’s four high speed lanes; then a 6o mile straight shot on route 12 to Packwood. Though this route is 70 miles longer, we high five it that we didn’t make the short-sighted decision to take to the hair-pinned, frost-heaved mountain roads of death. We just might be taking a peek into maturity’s big beautiful world. Over the past week in the northwest in early August, Hannah and I have been to Mount St. Helens in Washington and Crater Lake in southwestern Oregon. 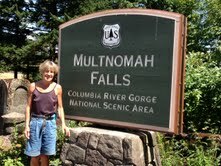 And yet it’s today’s hike on the Columbia River Gorge that is the most spectacular. Multnomah Falls lies some thirty miles east of Portland, OR along I-84. It’s a perfect location for the last hike of our vacation in the Northwest since we leave from Portland (PDX) tonight at 11P on a red eye non-stop flight to Boston, MA. With such easy access, the falls are mobbed on this first Thursday in August. Mobbed is no hyperbole. It’s Disney World during school vacation crazy; it’s Jersey shore in August nuts. At the base of the falls we step around tourists to view the falls in the distance. The good news is that 99% of the throng has no interest in hiking the Multnomah loop trail with us. I guess, in this case, we are the 1%. 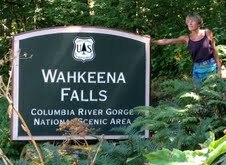 Beginning by walking for 100 yards west along Oregon state highway 30, we soon step into the forest and climb the rocky trail towards Wakeena Falls. And just like that we are up and away from the crowds. 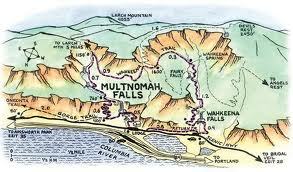 Our loop hike will go from Wakeena Falls to Devil’s Rest and back by Multnomah Falls today; it will take nearly four hours over some nine miles of mountainside hiking. In another 0.4 of a mile we are at the Wakeena Falls, which both fortunately and unfortunately, has a parking area nearby. As such, the crowds return. And that’s fine. There’s a fiesta buzz to the air. We remember that this natural wonder is not only for the uber-fit and half-crazed hikers. The spectacular falls are just the first taste of the five falls we will see today. Enjoy this 26 second video of Wakeena Falls. Once we leave Wakeena Falls, the crowds disappear again. 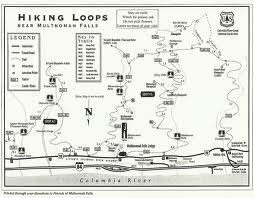 We resume our loop hike heading for Fairy Falls, our next aquatic attraction. The trail is a pleasing and certainly demanding set of switchbacks shaded by the summer forest. Another 0.8 of a mile we come to Fairy Falls. Mother Nature has presented us with another natural gift. Check out this 37 second video of Fairy Falls. The loop trail climbs through a rain forest of dense growth. These summer months are the dry ones here in Oregon. Come October, they will get the rain that they are known for and it will last til spring. Though not often, but regularly enough, we catch a glimpse of the Interstate 84 below us. Still just 3P in the afternoon and having hiked three miles up the mountain, we choose to hike on another 1.6 miles to the Devil’s Rest viewpoint at 2400 feet. It turns out the trail is dirt packed and easy on our feet with convenient switchbacks to take us up to Columbia River vista. 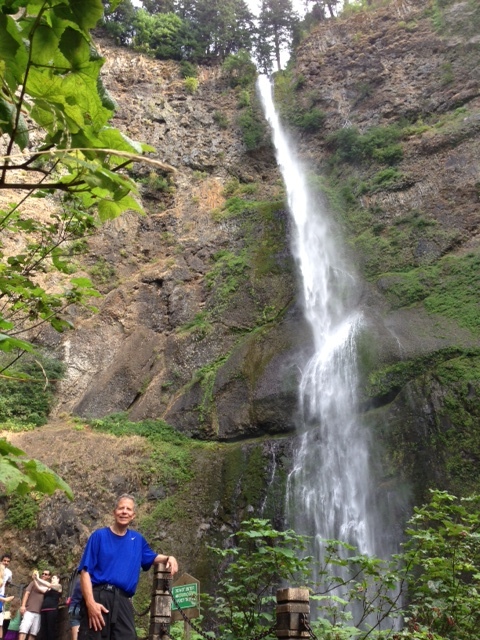 Two hours in, we hike back onto the Multnomah Falls loop and head for Ercola Falls. After two miles of hiking, we pick up other trail loopers at Ercola Falls. The trail remains rocky, but it’s all downhill from here. 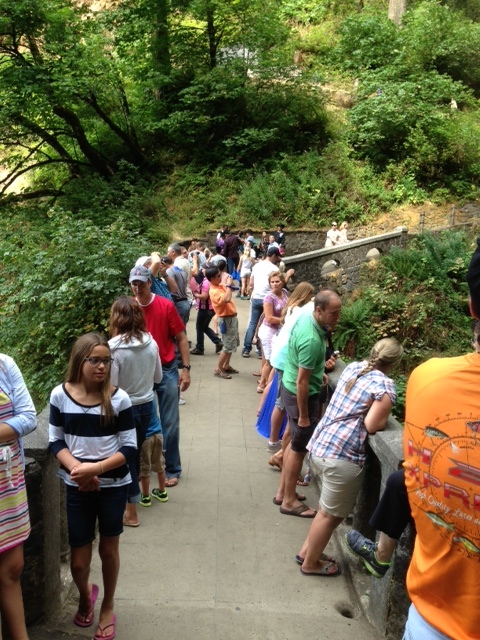 And then the crowds pick up; soon the trail is paved and leading to a view from the top of Multnomah Falls. The back and forth switchbacks allow many to scale this mountain side facing the Columbia River Gorge. When on a hike, if at all possible, hike with someone who is cool. Shades make this woman. 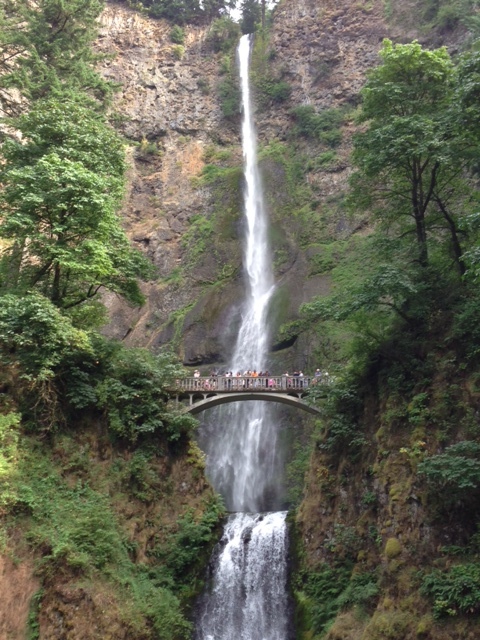 We are now asking sightseers to wait just a minute as we snap the multi-wonderous Multnomah Falls. A tad weary we sip red wine from our water bottles at the stone patio as the base of the falls. We are not in a hurry to have our vacation end any time soon.